We've been reading about it for a few months now. People are driving less due to the high cost of gas - me included. True to my low car diet resolutions (here), I've been walking/T'ing over to the grocery stores when I do my shopping. I do need to make a trip down to Rhode Island this weekend though, so I'll be using a Zip Car (I'll post a review of my experience afterwards). "It's apparent to me that the high price of gasoline has finally hit home for people and caused travel behavior changes that we did not see when gasoline was $2 a gallon or $3 a gallon," said Bernard Cohen, the state secretary of transportation. "Four dollars a gallon seems to be the turning point here in terms of people rethinking modes of travel." I found this to be pretty interesting. Why is four dollars a gallon the magical number that shifts people's driving habits? I think it's a combination of high gas prices and recession/inflation. Every day we read another article about gas being expensive or groceries being more expensive. If it was just gas prices that were going up, I don't think we'd be as panicked. But then again, I'm not sure it would be possible for gas prices to go up without everything else going up with it. With gas prices going up, maybe we'll start to invest in our mass transit systems like some of the other countries around the world. Just one example: Hong Kong. 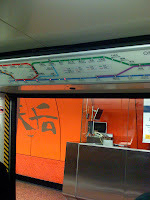 I remember back in the day when the Hong Kong subway resembled our T - but that was like almost 20 years ago. They've constantly upgraded to the point where I barely recognized it when I was there in January. The stations were clean, there were sliding doors in front of the actual tracks. 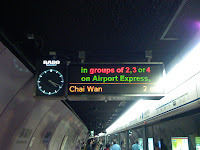 And most importantly, there was a display that showed exactly how long you had to wait until the next train arrived. Dear MBTA folks, take a trip to Hong Kong and try riding their MTR to get some ideas of what the T could be like. It'd be a worthwhile trip. 1 Response to "MBTA Ridership Is Up - Time to Upgrade the T"
As for the condition of the T - you get what you pay for. Other countries see mass transit as an investment. in this country we do not.